Best Bridal Lehenga Looks of 2017 - #Weddingz2017Rewind! As we make a new start to 2018, we would like to give a shoutout to all the real brides who inspired us with their impeccable taste in fashion, while choosing their wedding lehengas. We at Weddingz.in did a round up of all our favourite wedding lehengas spotted on real brides in 2017 - the ones who really stunned us. Believe us when we tell you 2017 did see some of the prettiest, loveliest and offbeat bridal lehengas. This Sabyasachi ice blue lehenga just had to be on our list! We are in love with the offbeat styling of the pale blue lehenga with emerald green kundan jewellry. All that glitters is definitely gold for this bride. She chose to wear a Sabyasachi gold shimmery lehenga paired with a sheer pink dupatta and looked her most stunning self. This bride chose to wear a custom made flouncy Manish Malhotra creation for her pheras and seems to have turned heads all the way. Anushka Sharma broke the internet literally with her blush pink Sabyasachi lehenga she wore for her private wedding in Tuscany with tropical flora and fauna hand embroidered in silk floss on the outfit. Amrita Puri chose to wear this stunning ivory and gold Sabyasachi lehenga from his Udaipur collection for taking her wedding wows. The lehenga comprises of hundred and eleven colours of silk thread in vintage Persian shades used to create a decorative base and embellished with bugle beads, hand-cut sequins, crystals and pearls, grabbing all eyeballs. Samantha Ruth Prabhu’s wedding lehenga is literally what dreams are made up of. She chose to wear an ice blue lehenga embroidered with silk resham in various pastel shades embellished with intricate glass beading, sequins and crystals . This ombre lehenga with varying shades of pink and zari embroidery of rose motifs had to be on our list of best wedding lehengas of 2017. . This classic white Abu Jani Sandeep Khosla lehenga comprising of sequined off-shoulder bodice with fringe details is definitely a sight for sore eyes. A bride can never go wrong in the traditional shades of red and gold and especially when it’s designed by the ace couturier Manish Malhotra. For her wedding Masoom Minawala chose to wear a Anamika Khanna floral embroidered lehenga with an Ivory base and hints of muted pink. We love how the 2 dupattas add the dramatic touch to the whole bridal look. Archana Vijaya’s mint green lehenga mirrors the vibe of her seaside beach wedding with its ‘surf wave’ blue and sandy gold accents. 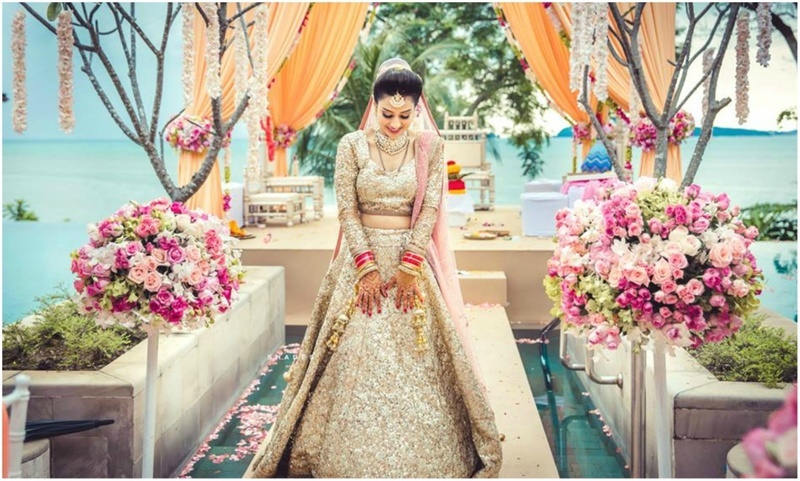 This bride who is an anchor and VJ, refreshed the traditional bridal palette with this standout ensemble. They say no bridal wear is complete without a touch of red and this bride’s red lehenga proves it right all the way. If totally haute and happening is what you wanna look like at your wedding, then you have to consider this ornate lehenga by Manish Malhotra. So this was out list of top 15 bridal lehenga looks of 2017. 2017 was definitely an year full of gorgeous & breathtaking wedding looks - Stay tuned for more ‘Weddingz 2017 Rewind’ looks!